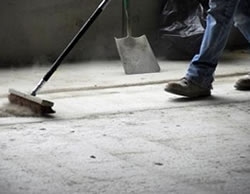 Why use Fox Cleaners for your After Builders Cleaning? 3. Costs – We charge a fixed price for ever after building cleaning assignment. No wavering in this standard whatsoever. 4. Value – As our customer, you will receive the bet in cleaning services available from our team with their renown professional attitude or you’ll receive a 100% money back refund. 5. Analysis – We inspect every job that we do. Our team of cleaners is required to photograph every property that they clean, before and after. 6. Warranty – We will cover any accidents that occur. 7. Quickness – Just call us and our team of cleaners will be working with you in the next couple of hours. How’s that for speedy service? 8. Quality – We use on the leading, top of the line cleaning products that are eco friendly and safe to you. 1. We remove the building materials and big garbage pieces outside the property. 2. We sweep the floors. 3. We clean every pain spot no matter where they appear. 4. We clean and disinfect the kitchen, bathrooms, toilets, showers, and windows. 5. We vacuum the entire property. 6. We steam clean all upholstery and carpet furniture pieces.